This image shows the waterfall of hot plasma streaking back toward the surface of the sun from the star's corona. Earth's nearest star has bad weather, too. 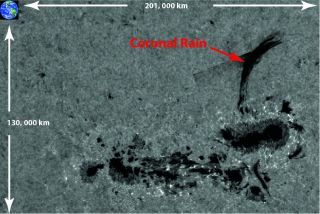 The mechanisms driving coronal rain are similar to the way rain forms on Earth, according to a statement released by the Royal Astronomical Society (RAS) in the United Kingdom. Scientists found that clouds of plasma in the corona cool, condense and fall back to the sun's surface in a waterfall-like arch if solar conditions are just right. "Showers of 'rain' and waterfalls on the sun are quite something, though I wouldn't recommend taking a stroll there anytime soon," Eamon Scullion of Trinity College Dublin in Ireland, who led the solar physics research, said in a statement. "But the parallels with weather on Earth are both striking and surprising." Scullion and his team also think that clouds of hot plasma reach the corona much the same way Earth's clouds form — through evaporation. In the sun's case, however, solar flares cause the evaporation, spewing material into the sun's corona, where it cools and rains back down. "The torrential rain storms, driven by solar flares, may play a fundamental role in controlling the mass cycling of the solar atmosphere and act as a kind of 'solar-scale' thermostat in regulating the temperature fluctuations of the solar corona," RAS officials wrote in a news release. Scullion and his team found that material in the corona changes from gas to huge plasma rain droplets, "where an exceptionally rapid fall in temperature causes material to change from rarefied coronal gas to 'raindrops,'" RAS representatives said.